After premiering at the Stratford Festival‘s 2017 season, The Virgin Trial by Kate Hennig has hit Toronto stages, being produced by Soulpepper. It’s on until February 3rd, so this is your last week to catch it at the Young Center For The Performing Arts (50 Tankhouse Lane). The Virgin Trial is a tense historical, political thriller that tells the story of a 15-year-old Elizabeth Tudor (Elizabeth The First). After an attempt on King Edward VI’s life, his Lord Protector brings in Elizabeth, called Bess in the show, to question her involvement and inquire about her supposed virtue. The Virgin Trial‘s political plots certainly draw parallels to modern politics, but it’s very much its own thing and I applaud that. The twists and turns keep you on the edge of your seat and wholly unsure who to root for. Except for Thom, played by Brad Hodder, who has to be the slimiest and most lecherous character I’ve seen onstage in some time. All of the big players feel fully fleshed out. The actors bring a great deal of nuance to their characters and in the case of Thom’s brother Ted (Nigel Bennett), my opinion of him changed over and over throughout the show. Yanna McIntosh as Ted’s partner-in-crime, Eleanor, was downright terrifying at times. 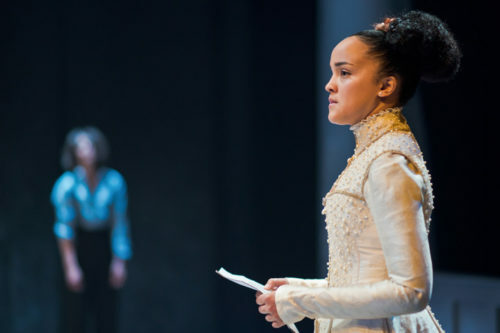 Opposing them is Bahia Watson as Bess, or rather, a young Elizabeth Tudor. Watson flits between naïve ingénue and wickedly smart political adversary. In some scenes, she just seems like a fifteen-year-old kid, and in others you see her for the powerful woman who’d consolidate English power. Bess is assisted by Ashley and Parry, played by Laura Codlln and André Morin respectively. I found them to be the show’s most likeable characters, but wished there was just a tad more nuance to their writing than undying loyalty to Bess. Bess’ other helper is her sister Mary (Helen Knight), she is by far the funniest character in the show; enigmatic and fascinating to watch onstage. Some of the content in this show is extremely violent. There are scenes of torture and sexual assault. The torture scenes are done in the wings with large white plastic sheets distorting the actors, while a live video feed is projected for the audience to see. At times this came off a bit obtuse, but it was effective nonetheless. One woman chose to leave during the second half, and wound up causing a commotion when she walked right into the scene going on in the wing. The lighting design by Kimberly Purtell and sound design by Alexander McSween are deliberately aggressive and jarring. There are strobe lights and loud bangs not dissimilar from Law and Order. They sometimes make you jump in your seat. This really helps to build tension and keeps the audience anxious. In other moments, like when Bess and Thom are on a ship looking up at the stars, or when Bess and Mary meet in secret in the rain, the tech lends an air of serenity. This was a tense political thriller laden with nuance and intriguing plots. Kate Hennig’s writing is sharp and engaging. The actors are all fantastic performers who bring life to beautifully crafted characters. I highly recommend seeing The Virgin Trial. Contains loud noises and strobe-lights, as well as scenes of torture and sexual assault. Shows are at 8:00 PM, with matinee performances Saturday and Sunday at 2PM. Image of Bahia Watson by Cylla von Tiedemann. Previous PostPlaylistings for the Week of January 28th, 2019Next PostCheap Theatre for the Week of January 28th, 2019.